On Tuesday, December 30, Betsy Ortiz of Walnut Creek was the Tech Museum’s 100,000th visitor to the Leonardo da Vinci exhibit. The exhibit features the most comprehensive display of the innovative art, science and engineering works of Leonardo da Vinci and his contemporaries. The exhibit includes more than 100 life-size and scale working models, hands-on interactive machines, multimedia presentations and two priceless works of art. The life-sized and scale working models are based on conceptual drawings and designs by Leonardo, Francesco di Giorgio, Mariano di Iacopo (Taccola), and others. These models recreated using tools and materials common in Leonardoís time. Most of Leonardoís machines were never built in his lifetime, as many could not have been built due to the lack of suitable parts. The exhibit has been extended to January 25, 2009 due to popular demand. There may be a further extension if high attendance continues. The week of January 12-17 is the third of four weeks in San Jose’s volunteer campaign against graffiti, called “Lend a Hand”. Volunteers are encouraged to get together that week and go out into the community to eliminate graffiti. The city will supply materials such as paint-removing solvent, safety goggles, gloves, sponges and rags for volunteers to use. These materials come in an anti-graffiti “kit” that is available any time from the city Anti-Graffiti Program. When I stopped by today to pick up my anti-graffiti kit, city staffer Paul J. Gonzalez, also an artist who’s painted numerous murals around downtown, offered tips on removing various kinds of graffiti. For example, to remove slap-tags, or stickers, he recommends just using water and vigorous scrubbing, rather than solvent. When numerous graffiti clean-ups have already disturbed the paint on a surface, he recommended just repainting, and he offered us a gallon of “city beige” paint that matches the color used for many city buildings. The anti-graffiti program is located at 501 Vine Street, near the corner of Almaden Boulevard and Woz Way. Drop in during the Lend a Hand week, January 12-17, to pick up your anti-graffiti kit, or schedule an appointment to pick up your kit any time by calling the anti-graffiti program at 277-3208. I suggest getting your kit early, to be prepared for the volunteer event ahead of time, then go out during Lend a Hand week to help wipe out graffiti in your neighborhood. Just to get a guess at how bad the economy is doing, I stopped by Vally Fair Mall and hiked up to the top level of the parking garage. Two days before Christmas, in the middle of the afternoon, there was plenty of parking to be had. Inside, the mall was busy, but not packed. I’m not sure if this is bad news because it means the economy’s likely to remain in the dumps for a while, or if it’s good news because it means that Silicon Valley has rejoined the real world, where everybody doesn’t get whatever they want whenever they want it. It’s about time. The Martin Luther King Jr. Library is finally opening up its Wi-Fi network to anyone with a valid library card. So even if you’re not a student, you will finally have access to the Internet from your laptop from within the library, and it won’t be limited to just the Web sites of the library, SJSU and the city’s official sites. For more information on the King Library’s Wi-Fi (and directions on how to log on), click here. For info about other library branches, click here. Or just call (408) 808-2000. You remember how to use a phone, right? This winter it is illegal to burn wood, pellets, or manufactured fire logs in any indoor or outdoor fireplace, fire pit, or wood or pellet stove when a Winter Spare the Air Alert is issued. Winter Spare the Air season runs from November 1, 2008 through February 28, 2009. I have discovered that there are a number of people unaware of this new regulation. The new rule also places year-round prohibitions on excessive chimney smoke and the burning of garbage, plastics, or other harmful materials in fireplaces and woodstoves. Violators will get warnings by mail. Repeat offenders face fines of as much as $2,000. It is okay to use gas-fueled fireplaces and logs, gas inserts, or electrical fireplaces. In the wintertime, fine particulate matter (PM2.5) becomes the pollutant with the greatest impact on air quality. Fine particulates can bypass the body’s natural defenses, penetrating deeply into the lungs and even passing into the bloodstream. Prolonged exposure to the fine particulates in wood smoke has been linked with aggravated asthma, lung and heart disease, and increased mortality rates. Wood burning in fireplaces and woodstoves creates about one-third of the winter particulate matter air pollution in the Bay Area. So, how do you know when it is a Winter Spare the Air day? Winter Spare the Air Alerts are available by calling 1-877-466-2876, visiting the Spare the Air Program or Bay Area Air Quality Management District websites. There you will also find information about signing up for e-mail alert notifications and automatic phone call alerts. The Winter Movie Series, featuring holiday themed and classic films, begins this Wednesday December 17 and runs through December 28 at the California Theatre downtown San Jose. Built in 1927, the 1,119-seat California Theatre was transformed into a major performing arts center by adding state-of-the-art audio and video technology in 2004. A new Wurlitzer Organ has been fully restored and will play each night before the main feature. All tickets are $5.00 and you will receive a coupon for free popcorn. Children under 12 admitted free with paying adult to special 1:40 pm matinees Saturday and Sunday Dec. 20 & 21. Parking is available on South First Street in back of Eulipia Restaurant. You can access this lot from South Second Street. Parking garages are also available at the San Jose Convention Center accessible from both Market Street and North Almaden Avenue. Other parking options include the garage above the Camera Cinemas accessible from Second or Third Streets, and a lot at the corner of San Carlos and Market Streets. When I leave work at 6 pm and its already fully dark, its nice to see a few brightly lit houses along the way (The one in the photo is on Sloat Ct. in Santa Clara). They tell me that someone has gone to a lot of trouble to light up the darkness for the rest of us. 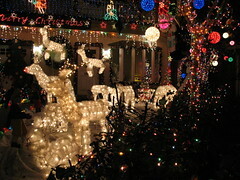 I was going to suggest that readers mention the best-lit houses they know around town, but then I found Lights of the Valley, a website that catalogs some of the best light displays in various towns around northern California, including San Jose, Santa Clara, Campbell, etc. But, even on that site I don’t see any real “Candy Cane Lane”, a whole street decorated with bright lights and holiday cheer. If you know about one of those, please leave us a comment and let us know.